"A new pattern has just been released in time for your fall to holiday knitting pleasure: meet 'From Dusk to Dawn',a loose, flowing shrug-like cardigan created from two abundant sleeves enlivened with undulations of feather & fan mid-sleeve. "The upper sleeves extend across the front and back in multiples of yarnovers-knit-2togethers for a lacy but easy-to-knit effect. A band is picked up and knit around the front neck opening along with a shaped back band extension. The front comes together in simple lines fastened with a button or pin. 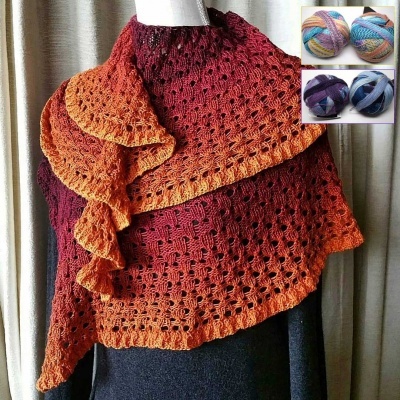 "To make the piece longer, the lower band could be made longer or even knit side to side for a defined lower edge that does vertical lines rather than horizontal. 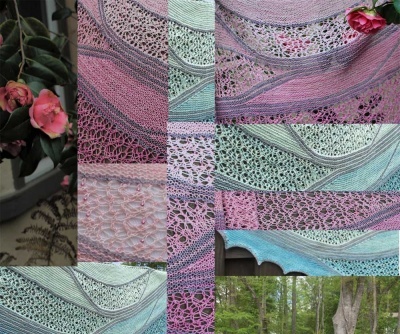 Total estimated yardage needed for this design is 700 yards of mixed yarns. "This little number could dress up your LBD (little black dress) or look equally luscious for party season. It is amazingly flattering. Imagine it in black and silver or a mix of your favorite hues. 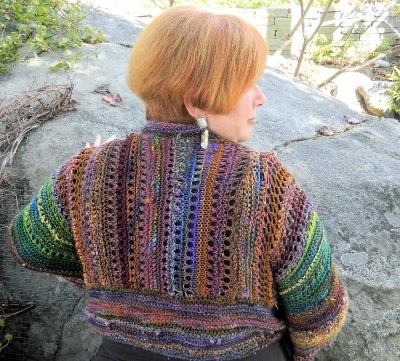 The original unfurled for me in jewel tones -- emeralds, sapphire, perridot, amethyst, peridot and turquoise set against a mix of bronzy browns, reminding me of colors aglow in lamplight after the sun goes down. Best of all, the design works for many body shapes. Makes yours longer by extending the bottom bands." What we offer via this web page is a printed copy of the pattern, on heavy-weight paper and placed in a sheet protector, mailed to you. If you prefer a PDF file to download and print yourself, go to Jane's website -- she has them there for your purchase. This is quite a unique piece, fun and interesting to make.